While diaper bags are very necessary, it doesn’t take long before it becomes a pain to carry them around. By the time you transition to a toddler diaper bag, you’re probably pretty sick of carrying one around! Let me tell you, he loves carrying that thing around. And I love not having to carry his stuff anymore! Diaper backpacks are definitely the way to go when it comes to toddlers. And, you don’t have to carry nearly as much stuff with a toddler. 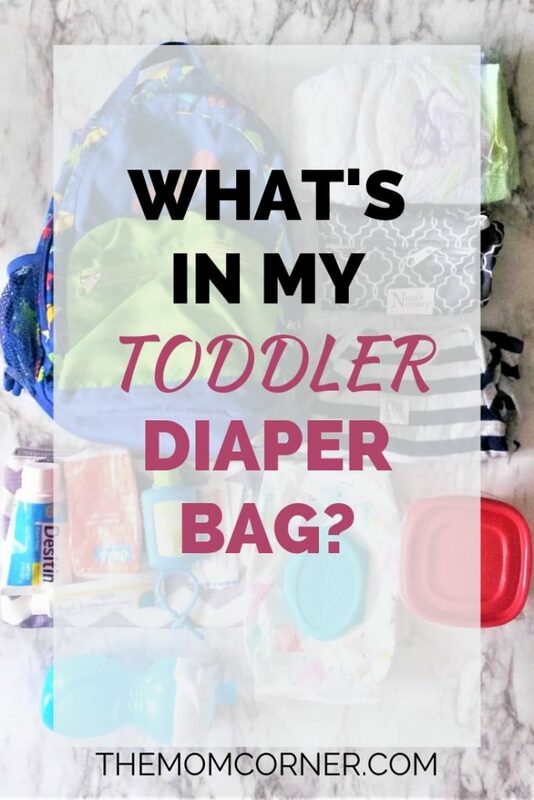 But what do you keep in your toddler diaper bag? To help you through this transition, I’m going to tell you exactly what we keep in my toddler’s diaper bag. 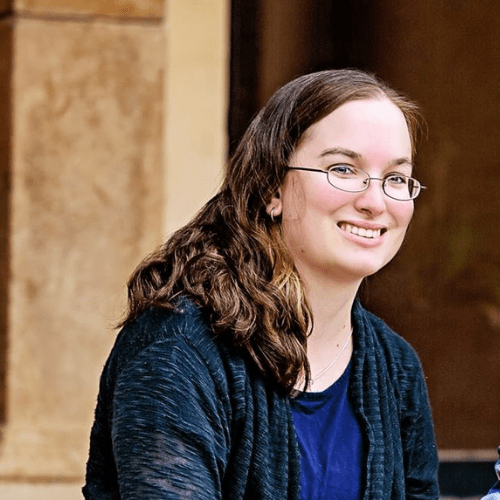 I’ll also include a printable checklist for you at the end of this post! First thing’s first–you have to have a bag to put the stuff in. You can keep using a regular baby diaper bag if you want to, but I highly recommend investing in a toddler backpack. Toddler backpacks are just the right size for little boys and girls to carry. They can also be surprisingly spacious and hold quite a bit of stuff. 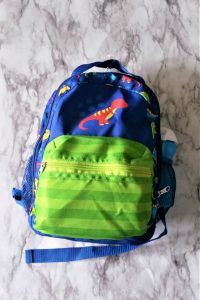 If you’re interested in getting a backpack for your toddler, Amazon has some ridiculously cute toddler backpacks to choose from (and many of them are pretty inexpensive too!). Obviously, you’ll want to include diapers in your little one’s backpack. I keep about four in there at a time, which is plenty to last him for the few hours we’re out of the house at a time. If your toddler happens to be potty trained or in the process of training, definitely include a few pairs of extra underwear or training pants. Whether your child is potty trained or still in diapers, you’ll want to put some wipes in there. Besides being used to wipe your toddler’s bum, you can also use wipes to clean off tables, surfaces, sticky hands, and more. Wipes are probably one of the most versatile items to have on hand with little ones! Even though my toddler does blow out his diaper or leak anymore, I still like to keep an extra change of clothes in his bag. Just in case. In my experience, things tend to go wrong when you aren’t prepared for it. So for safety’s sake, I throw in at least a onesie or t-shirt and pants for when we’re out of the house. Wet bags are great for containing wet clothes or soiled diapers when you’re out and about. You can use a plastic grocery bag for this, or get a wet bag designed for this purpose. 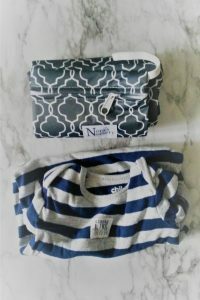 I recently switched out my grocery bag for a wet bag that I got with our new cloth diapers. It’s super cute, and I like that I’ll be able to use it for diapers if we need to do a diaper change on the go with our new diaper setup. Toddlers and snacks go together like peanut butter and jelly (or something like that!). I personally keep a small Rubbemaid container of cheerios in my toddler diaper bag. 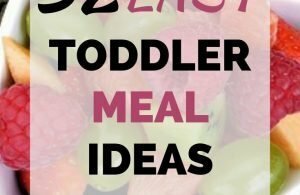 Snacks don’t necessarily have to be fancy, or you can go all out and get all kinds of great toddler snacks. I’m also looking into getting these reusable snack bags to use so I can start packing pretzels without wasting a ton of sandwich bags. If you have snacks, you’ll definitely need a sippy cup. Our absolute favorite sippy cup is the Munchkin Miracle 360, which allows babies and toddlers to drink the same way they would from a regular cup. But without the mess! 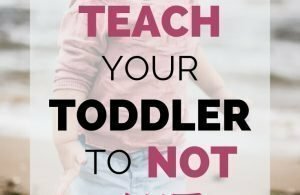 If your toddler still uses a pacifier (no judgement if he does! ), you’ll probably want to stick a pacifier clip in his bag. I love that these clips help keep the pacifier from getting lost, or from being dropped on the ground. Basically it contains things we really only use in emergencies. The pouch itself came with our original baby diaper bag. It’s small enough to easily fit in his backpack, and keeps any spills contained if a container leaks. In our emergency pack I keep a small container of diaper cream. We hardly ever use this anymore, but I like to have it there just in case. That way, if a diaper rash does spontaneously break out, we have something to put on it right away. I actually haven’t had need to use this yet (thankfully! ), but it’s another product I like to have on hand just in case. 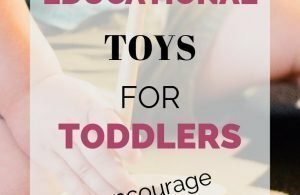 Toddlers are so active and get cuts, bumps, and bruises so often. It’s always good to have something on hand to clean and treat a cut when you’re on the go. A couple bandaids are also a must in an emergency pack. You never know when a scrape or cut will need a bandaid. Instead of having to search for one wherever you are, play it safe and stick a few in your emergency pouch. Tissues are also an item that you never know when you’ll need it. From wiping snotty noses, drying off tears, and cleaning off hands, tissues are pretty versatile. 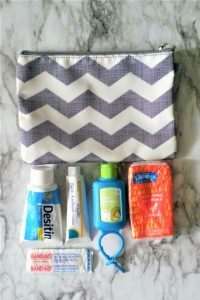 Keeping a small travel pack of tissues in your toddler diaper bag will save you the hassle of having to track one down when you really need it. Lastly, I keep a small container of hand sanitizer in my emergency pack. You never know when there won’t be soap available after a diaper change, or when your toddler needs his hands cleaned off before a snack. 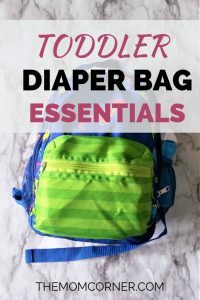 That’s everything I keep in my toddler diaper bag! What do you keep in your toddler’s diaper bag? Do you prefer a regular diaper bag, or a toddler backpack? Let me know in the comments below–I’d love to hear from you! Don’t forget to grab your free toddler diaper back checklist! Click the image below to preview and download your copy.